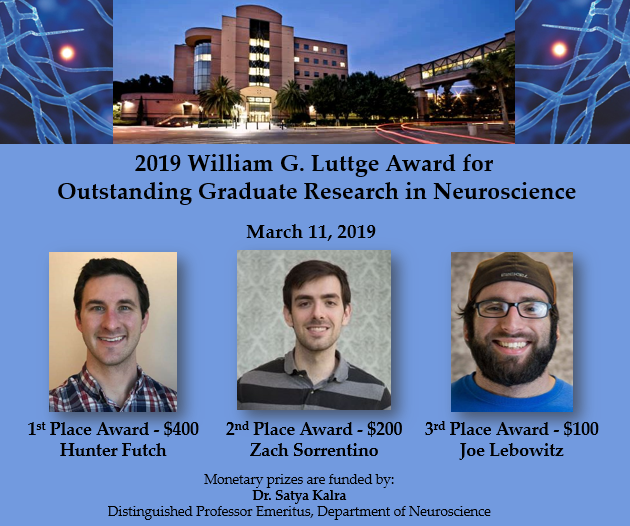 The William G. Luttge Award for Outstanding Graduate Research in Neuroscience was established in the honor of Dr. Luttge, the Founding Executive director of the McKnight Brain Institute. This distinction is awarded annually to Neuroscience PhD students who participate in a 15-minute oral competition. The top three students will receive monetary awards donated by Dr. Sati Kalra, Distinguished Emeritus Professor of Neuroscience. The 1st place winner also receives an engraved plate on the departmental plaque and goes on to represent the Neuroscience concentration at the College of Medicine Medical Guild Competition. Thank you to all who participated and congratulations to Hunter, Zach, and Joe!